An extensive part of the Stephenson Quarter of Newcastle City centre has been redeveloped with PCA Durham involved in the redevelopment of Stephenson Square, a public space linked to the Crown Plaza hotel. The Stephenson Quarter was named after George and Robert Stephenson who had their drawing offices and workshops here. Robert Stephenson Company was founded here in 1823 and was the world’s first purpose built locomotive works, including ‘Locomotion’ and the ‘Rocket’ . The offices and workshops remained until the end of the 19th century when the company relocated to Darlington. Archaeological trial trenches were excavated across the location of two of Stephenson’s workshops shown on the 1862 Ordnance Survey map as a large smithy and small workshop. Structural remains in this area were well preserved just below ground surface. A complex of brick-lined flues and furnaces were exposed with sample excavation revealing a substantial stone building predating these features. Further excavation occurred ahead of landscaping and drainage works for the construction of the new UTC (technical College). In the 19th century this part of the site was occupied by the White and Brown Iron Foundry which was constructed between 1830 and 1849 and demolished by the early twentieth century. The south-west corner of the foundry was revealed within the excavation area; the external walls and internal divisions were of substantial sandstone construction. An external brick furnace survived along the southern wall and brick-built structures which were heat affected had been added to the internal sandstone partitions. The Durham team worked through tough conditions to ensure that the archaeological works complied with the development programme. PCA completed an extensive and complex programme of archaeological work as required by planning consent ahead of and during the redevelopment of this key strategic site in Salford. The site was formerly the Exchange Railway Station, which was largely demolished in 1969, and comprised a large brick viaduct which carried the railway lines and former station above street level. During the initial evaluation and historic building survey the site was actively used for commercial car-parking, PCA worked to minimise disruption to the site’s use during the archaeological works. 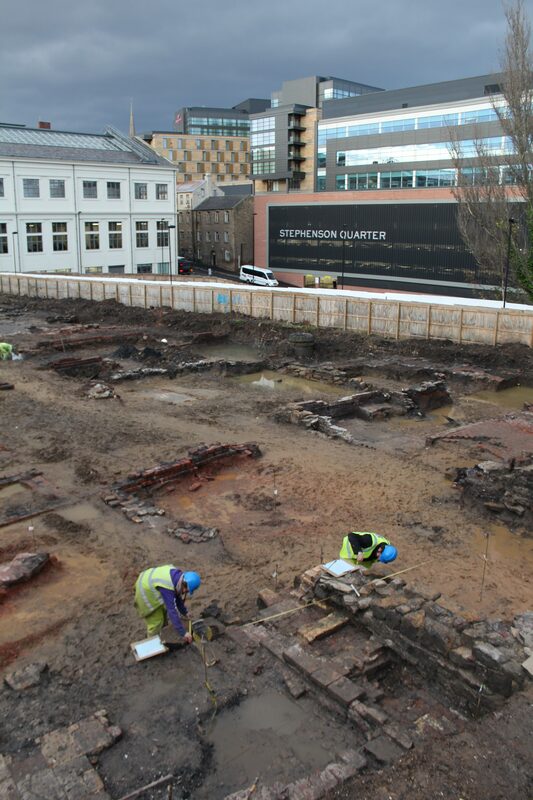 The evaluation revealed good survival of important medieval and post-medieval remains, leading to a requirement from the archaeology advisors to the City of Salford for further mitigation works to comprise a strip, map and record investigation. The work was completed prior to demolition of the viaduct structure, in order to prevent delay to the construction programme once demolition began. 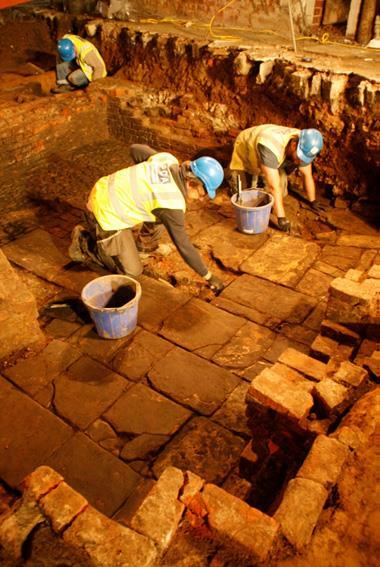 The work revealed evidence for the occupation of the historic core of Salford from potentially the late medieval period through to the late 19th-century. The archaeological remains, with the aid of cartographic and documentary evidence, chart the development of the site through several centuries, illustrating 17th, 18th and 19th century urban development as this historic core of Salford bustled with dwellings, shops and markets, courtyards, textile industries and other industries, along with cultivated garden plots. The Historic Building Recording project, coupled with the below-ground archaeology, documented and evidenced the mass clearance process in the 1870s and 1880s as the construction of the Exchange Station and the London & North Western Railway cut a swathe through the area. The outstanding project justified its publication within the Greater Manchester’s Past Revealed Series (No 18), released to local acclaim in 2017.